First of all, thank you for a wonderful widget. I've been using it every day to listen to the World Service for ages (3.1 or 3.2). I just updated and lost access to BBCw. No going back possible, eh? Amazing, been looking for this forever. feature request: a search/filter box would make this even better! Peter, the World Service might still be accessible using older versions of the widget (it is still on the old BBC ListenAgain system rather than the newer iPlayer one that the newer widget uses - I expect it to transition over at some point). All the old widget versions are available on this site. Just remove your newer one via the Dashboard Manager Widgets first. That should say 'Dashboard - Manage Widgets'. Good luck! 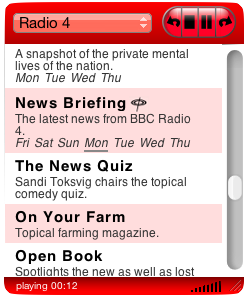 I thought I'd already tried it, but I just downloaded 3.1 and have got the World Service back. I was wondering if I could ask you for another favor. Great widget, I have been using it for a while now and thanks to "Amnesty Singles" I run it as an app on the desktop. Any chance you could let me know? Hey Mick, glad you like it. You'll probably have to reload the widget after you make the changes. Thank you, that works a treat :-) and thanks again for making this widget in the 1st place: the widget really helps me while studying. I seem to have lost the option to listen Live. Intentional? Not intentional. The BBC must have rearranged their web-site slightly. I'll try an fix it in the next version. thanks for this widget, I use it almost everyday!! how nice we could archives from bbs in dashboard!!! hi, I just download the new version of this. I am using leopard, every time I back from dashboard to desktop then the radio stop, I go to dashboard again and the radio continue, after I back to desktop then the radio stop. please help to solve the problem, thanks. Hi Cyh, it's probably because of the Real Player version. Please see the top of this page. The listenAgain Widget says has update version today, but after I click download, nothing happen. is that any step that I miss? CYH: Use safari and click on the link at the top of this page. The widget will download and install. For a couple of days now the widget doesn't show listings. It seems to download them (from looking at traffic),but the listing area stays blank.